When I saw this recipe here I knew I had to give it a shot. And WOW is it good! And quick! I had supper on the table in 20 minutes, seriously; this is a fantastic weeknight meal. I made two pork chops, but a full recipe of gravy because I like it gravylicious. The Yankee ate all of his and some of mine. We tried to get The Kiddo to eat a bite of broccoli, and told him they were trees. He then wanted to know if they were Christmas treees and therefore where the presents were. Parenting backfire. But great supper! This is definitely staying in the rotation. I made these a while ago hubby and I loved them! 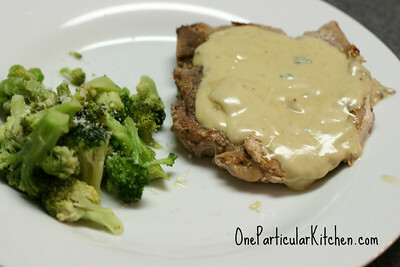 Yum, I love blue cheese but have never tried it with pork chops, or in a gravy. I’m definitely going to have to give this a try! Yum, blue cheese gravy sounds good. Isn’t that so good! We love it!